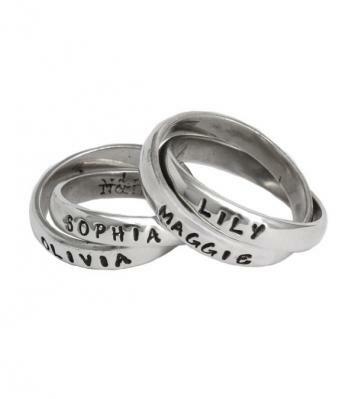 "Stackable Grandmother's Name Rings Personalized for Four Children, Silver, Set of 2 Doubles"
Create a beautiful stack grandmother's ring by stacking two double rings. Each grandchild's name will be stamped on the silver bands. The more the merrier! If you have four kids and want to wear them around your finger everyday we have an unique solution! Stack two of our double rings to make the perfect stacked ring representing all four grandkids. Sizing: Since this ring will be really wide you will need to determine your regular size and then go up a half to a whole size to account for the thickness. Please remember we can always make rings up to a half size larger but not smaller. If you are unsure of your size, you can purchase a ring and select ring sizer from the dropdown menu. We will send you a ring sizer and instructions on how to email us your size.